The Playlist page is where you view the currently loaded Playlist. A Playlist is a collection of Presets and Controls dictating whether they should be played one after another or individually, whether to automate tempo changes, etc. etc. You can have as many Playlists as you like. They are managed from the Playlist Manager. A good way to get familiar with the things Playlists can do is to view the Playlist Tutorial (from the PolyNome Menu under Tutorials). Then watch the info videos ⓘ associated with each item in the Example Playlist. a) Button to go back to the main page. You can also just swipe to the right as the main metronome is always just to the left of this page. b) View button. Tap this button to switch to Presets or Playlist Manager pages. c) Edit button. Tap this to remove or re-order the playlist. You can also perform actions on items in the playlist by tapping this button, selecting items, then using the Actions Menu that appears at the bottom of the screen. 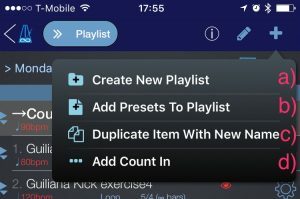 d) Add Button: Tap this for creating a new playlist or adding items, or a count in, to the existing playlist. e) Playlist name: Tap this for print/email options or to load the Playlist Manager. Tip: You can press and hold to load the Playlist Manager directly. f) Playlist Notes: Tap this to add notes for the Playlist, or to view existing notes. g) Eye Notes button: Tap this to view Eye Notes. These are notes associated with the currently selected item in the Playlist. 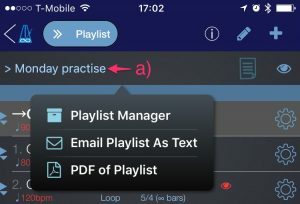 Tapping the Playlist name ‘a)’ brings up a menu with options for emailing and printing the current Playlist. Options for the layout of the PDF are available in the PolyNome menu under Preferences. Tap and hold the Playlist name to jump directly to the Playlist Manager. Tapping the Playlist Add Button brings up the menu below. a) Create New Playlist. This will take you to the Playlist Manager page and create a new Playlist. b) Add Presets To Playlist. This will take you to the Presets Library where you can tap Presets to add to this Playlist. Note: You can add multiple copies of the same Preset to a Playlist. c) Duplicate Item With New Name. This will duplicate the currently loaded Preset and add it to the Playlist. Note that this item will not appear in the Presets Library. You can modify the item once it’s created by going to the main Metronome page and modifying it to your liking. This is the quickest way to add new items to a Playlist if you haven’t already created them as Presets that you’d want to use in multiple Playlists. d) Add Count In. This will add a Count In Preset to the top of the Playlist. Count in Presets differ from regular Presets in that they will only be played once even if the Playlist is set to loop. Tap the Playlist edit button ‘a)’ to enter edit mode. b) Select one or more items. c) Use handles to rearrange items. d) Tap the Actions button for actions to perform on the selected items. e) Remove the selected items from the Playlist. Note: Removing items from a Playlist doesn’t affect the original Presets they were copied from. Each row in a Playlist has a name, tempo, rep/timer value, time sig and length in bars of the pattern (taking into account the rep value) and a gear button to modify some of these items. a) Play/Stop when reached indicator: These symbols appear when Auto Advance and Play When Advancing are turned on in Playlist Controls. A Play symbol above the downward arrow means the item will play when reached. A stop icon above the downward arrow means the item will stop when reached. b) Tempo. This indicates the tempo of the current item. TIP: You can tap the padlock icon on the tempo at the bottom of the page to turn on Tempo Lock. This overrides the individual tempos of the items in the playlist meaning you can change them all at once. c) Rep/Timer value. This indicates how many reps or how much time the item will play for. When the value is reached PolyNome will either stop, or move onto the next item in the list depending on the settings in Playlist Controls. d) Gear button. Tap this to edit features of the item including Rep/Timer value, tempo, Play/Stop when reached and Eye Notes. e) Eye Notes indicator. When this is blue it means the original Preset has notes. When it’s red it means the item has overridden notes (set by tapping the Gear button). To view the notes tap the Eye Button at the top of the Playlist page. f) If you see the book icon or a download icon it means the Preset item was imported from the Public Library or from another user. Tapping the Eye Notes button (item ‘g)’ in list at the top of the page) brings up the Eye Notes viewer. This is a black panel which displays notes associated with the current Playlist item. a) Font Size button. Tapping this brings up the Font Size selector. You can set the font size using the slider. Note that the Eye Notes viewer can be in a minimised state (as in the image abov) and a maximised state (where it takes up most of the screen). You can set different font sizes for each state. b) Override button. When this is on the selected font size will apply only to the item that is currently selected. This means you can customise the font size for each item in the playlist to allow the notes to be the exact size you require. When the button is off you’re changing the font size for all items that don’t have override turned on. c) Font size slider. Use this slider to modify the font size. The changes will be saved when you tap outside the pop up menu and it disappears. e) Gear button. This is where you go to set overridden notes for a Playlist item. When enabled you’ll see a red eye icon in the Playlist item row. The bottom section of the table is the Playlist Controls and Playlist Time rows. a) Playlist Controls. 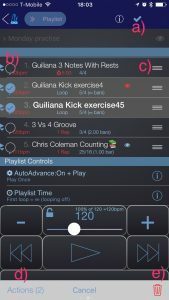 Tap on this row to set options for auto advancing, playlist looping, automatic tempo changes, tempo boundaries and auto advance sounds. Find out more by tapping the ⓘ button on the row. b) Playlist Time row. 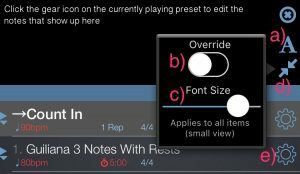 Tap on this row to view options for setting Reps or Timer for all items in the Playlist and for setting the overall Practice time. Find out more by tapping the ⓘ button on the row. a) Tempo Tweak buttons. Use these to increment/decrement the tempo. TIP: In the PolyNome Preferences menu you can choose whether the value of these buttons follows the value on the main page, or is +/-1. b) Tempo. 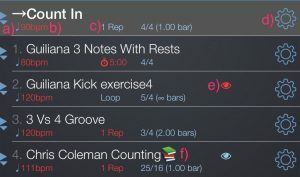 Tap the tempo to bring up the Quick Tempo Entry page and set the tempo for the current Playlist item. 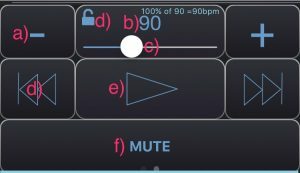 c) Tempo Percentage slider. Use this to modify the tempo of all items in the Playlist by a certain percentage. This is useful if you have a Playlist that represents different sections of a song and the tempos are related. If you want to play the song a bit faster or slower you’ll want to make the modifications using the slider so the changes are relative. d) Previous/Next buttons. Tap these to move backwards and forwards through the items in the Playlist. e) Play button. Tap to stop/start. Tap and hold to bring up Button Picker. f) Mute button. Tap this to mute the system volume. Tapping and holding the Play button will bring up the Button Picker. You can use this to hide buttons that you don’t require. For example, in a gig situation where all the tempos are correctly set for the songs you might not need to see the tempo or tempo tweak buttons, and you might not need the mute button. You can disable these to leave more space for everything else. The button states are saved with each Playlist.